When a weak area of a blood vessel expands or bulges significantly, physicians call it an aneurysm. Most aneurysms occur in the aorta, your body's largest artery. The aorta carries blood away from your heart to the rest of your body. The part of your aorta located in your chest is called the thoracic aorta, and when your aorta reaches your abdomen, it is called the abdominal aorta. Peripheral aneurysms affect the arteries other than the aorta. Most peripheral aneurysms occur in the popliteal artery, which runs down the back of your lower thigh and knee. Less commonly, peripheral aneurysms also develop in the femoral artery in your groin, the carotid artery in your neck, or sometimes the arteries in your arms. 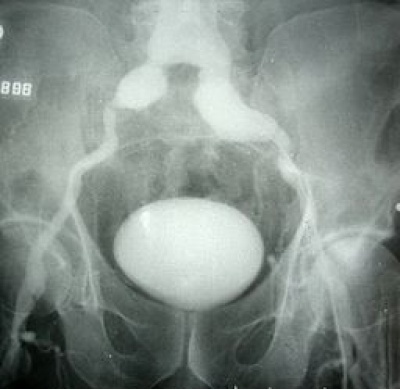 A special type of peripheral aneurysm that forms in the arteries feeding the kidneys or the bowel is called a visceral aneurysm. If you have a peripheral aneurysm in one leg, you are more likely to have an aneurysm in the other leg. You also have a greater chance of having an aortic aneurysm. Aortic aneurysms can cause serious complications because they can burst or rupture. Peripheral aneurysms do not rupture as often as aortic aneurysms, although they can do so. However, peripheral aneurysms more commonly can form clots that may block blood flow to your limbs or brain. Peripheral aneurysms, especially if they are large, can also compress a nearby nerve or vein and cause pain, numbness, or swelling. You may not feel symptoms with a peripheral aneurysm, especially if it is small. Two out of 3 patients with a peripheral aneurysm may not notice any symptoms. If the carotid artery is involved, the symptoms can include transient ischemic attacks (TIA) or stroke. These are described in the sections on carotid or cerebrovascular disease. If the bowel arteries are involved, the symptoms can be similar to those for mesenteric ischemia and are described in the section on mesenteric ischemia.